A favorite luxury fabric for centuries, charmeuse is traditionally made from 100 percent silk, though recently the definition of charmeuse fabric has expanded to incorporate a less expensive polyester version. You can put charmeuse fabric to different uses, though most commonly it's used to make dresses for special occasions, since the fabric drapes well, and for interior decor. Very soft and lightweight, charmeuse fabric is known for its lustrous sheen. Made of either silk or polyester thread woven in a satin weave, charmeuse has a shiny front side and a dull back side. This delicate fabric feels luxurious to the touch and looks expensive. Charmeuse sometimes goes by the name of crepe back satin. The word "charmeuse" comes from the French word for a female charmer. This etymology speaks to the beauty of charmeuse fabric and its traditional use in women's clothing, especially formal dresses. Its history goes back much further, however, to the ancient Chinese discovery of silk. While the exact date of the discovery is debatable, legend has it that silk was discovered around 2700 BCE by the Chinese emperor's wife. For centuries, it was a highly guarded commodity and exported only as a finished product. Charmeuse has traditionally been associated with nobility due to its luxurious look--it has even been called the "Fabric of Emperors." Charmeuse's alternative name of crepe back satin refers to the weave that creates the fabric, which can be achieved with either silk or polyester yarn. 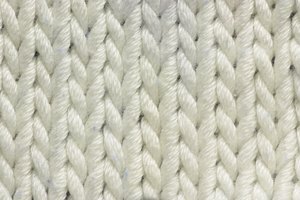 "Satin weave" refers to a weave where the face of the charmeuse fabric is covered with floating warp yarns (or filling yarns) and no twill line is visible. 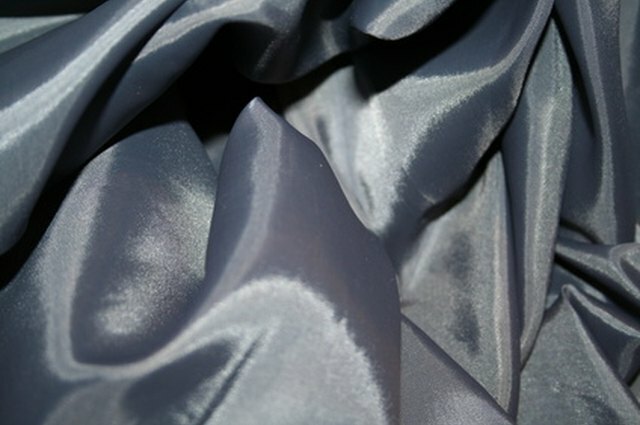 This creates a smooth and often shiny surface, though it also makes the fabric more difficult to sew. The back of charmeuse gets a crepe effect due to crepe yarns (hard twisted yarns, which are twisted more than regular yarn in the manufacturing process), woven throughout the filling yarns. The crepe back makes the satin a bit easier to work with, as it becomes stronger and less slippery. Charmeuse is not a fabric recommended for beginners, due to the difficulty many people have in working with the cloth. Due to its sheen and softness, the fabric can easily slip through your fingers and through the pedal of the sewing machine. 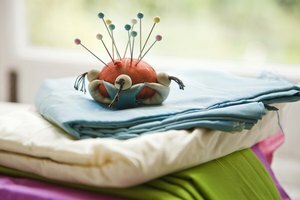 It can also pucker at the stitches and pins can leave permanent holes. Use smaller stitches and finer thread when sewing charmeuse to minimize the effect of the process on your garment. While silk is the traditional material of charmeuse and remains the most coveted choice today, it can be quite expensive and even harder to sew. 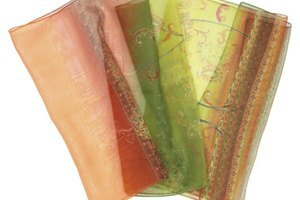 Polyester, which can closely imitate silk charmeuse, is a cost-effective alternative. While, to the eye, polyester and silk charmeuse may be indistinguishable, polyester charmeuse's affordability makes it the more logical choice for some occasions, especially bridesmaid and prom dresses. It's also becoming more common as an interior decorating fabric, due to its durability. Polyester is stronger and easier to clean than silk. Charmeuse has traditionally been a popular fabric for women's clothing. Today, it's commonly found in wedding dresses, bridesmaid dresses, prom dresses and theatrical costumes, since its sheen reflects well on the stage. Charmeuse is also popular for lingerie and nightwear, due to its feel against the skin. The luxurious fabric also finds it way into the home in drapes and occasionally on sofas and in throw pillows.